The huge cost of failed healthcare projects confirm that the problem is systemic. 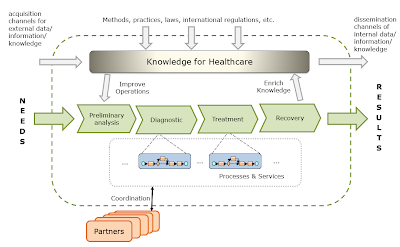 To solve it let us expand the scope to the whole healthcare eco-system. Without doubts, each healthcare organisation within the eco-system has its unique business processes, but those processes are “constructed” from typical business working practices. The latter can be common for any sector as well as specific for the healthcare sector. Thanks to BPM, these working practices can be formalised as actionable (e.g. in BPMN) process fragments. So, instead of spending money to implement unique business system for each healthcare organisation, let us consider a common platform, which allows to easy implementing unique business processes from a coherent set of world-class working practices and deploy this platform into each healthcare organisation. 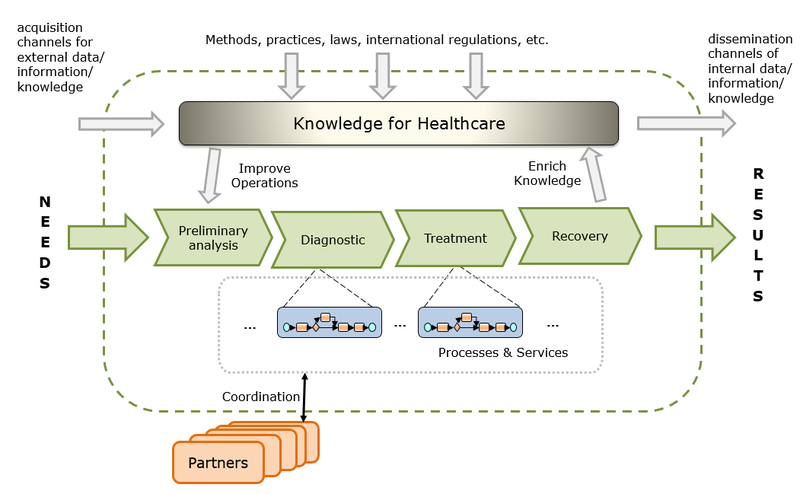 existing achievements in the standardization of the interaction between medical applications, HL7. The platform must standardise and simplify core elements of future enterprise-wide system. For any elements outside the platform, new opportunities should be explored using agile principles. These twin approaches should be mutually reinforcing: the platform frees up resource to focus on new opportunities while successful agile innovations are rapidly scaled up when incorporated into the platform. An agile approach requires coordination at a system level. To minimise duplication of effort in solving the same problems, there needs to be system-wide transparency of agile initiatives. Existing elements of the platform also need periodic challenge. Transparency, publishing feedback and the results of experiments openly, will help to keep the pressure on the platform for continual improvement as well as short-term cost savings. The platform will accelerate the implementation of following technology-enabled innovations. Security is compared with private banks. 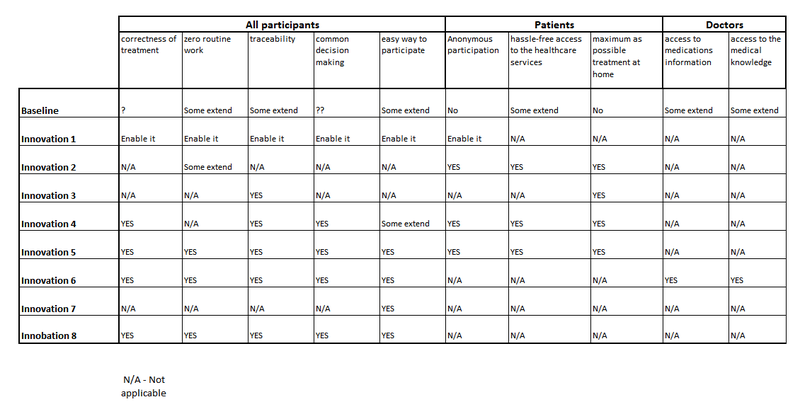 World-wide access for patient’s data. Avoid hassle for trivial cases. Systematic caring, faster alerting to prevent complex situations. Improving the quality of treatment. Predefined coordination and alerting (e.g. for taking pills). Standard interfaces for services in standard processes. Opportunities for small and local businesses. The joint work of all participants is coordinated in a transparent and traceable manner. Guaranteed audit trail. Guaranteed goal. Patients – hassle-free access to the healthcare services, correctness of treatment, maximum as possible treatment at home, cost. Doctors—zero routine work, access to the medical knowledge, access to medications, traceability. 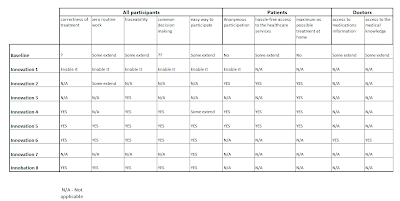 Other service providers – minimum overhead, common (with doctors) decision making. Insuring bodies – traceability, cost of overhead, correctness of treatment. Insurance companies – correctness of claims, correctness of treatment. Governments – overall quality, overall cost. Other services – easy to have business the main participants. Some of those concerns will be address by mentioned above innovations. The wide use of the same platform will allow Geographical expansion of services, the virtual doctor's office and unification of basic healthcare services.